a) to carry out condition surveys and inspections of footpaths. b) with the agreement and permission of Cheshire East Council and the landowner, where necessary, to carry out or to organise maintenance, repair and improvement works. c) to promote publicity and information about footpaths. e) to establish new footpaths where appropriate. f) to report, to the competent Authority, any obstructions which prevent free access to the footpath. Established in 1999 after the dissolution of Parish Paths Partnership. Membership 1st September to 31st August Membership Subscription £3 per annum. 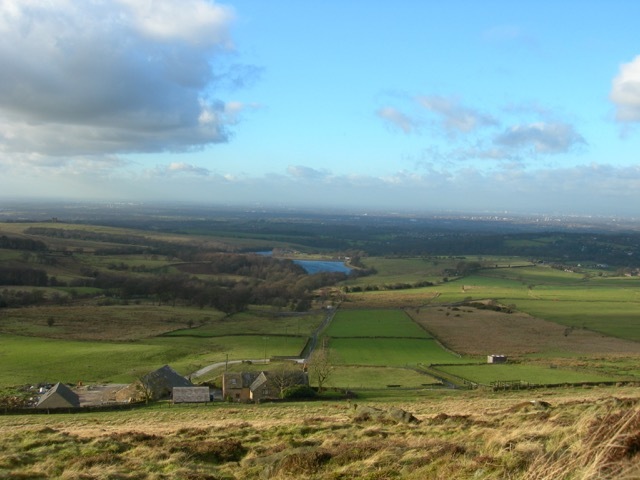 The Parish of Disley, covering some 9 square kilometres, enjoys breathtakingly varied scenery: wooded valleys, rolling farmland and typical Pennine moorland punctuated by rocky outcrops of Millstone Grit. Disley, including the Gritstone Trail, Midshires Way and North Cheshire Way.Our pubs, cafe and excellent rail and bus links with Manchester, Stockportand Buxton, make Disley an ideal centre for walkers. as well as the on-going battle with encroaching vegetation. 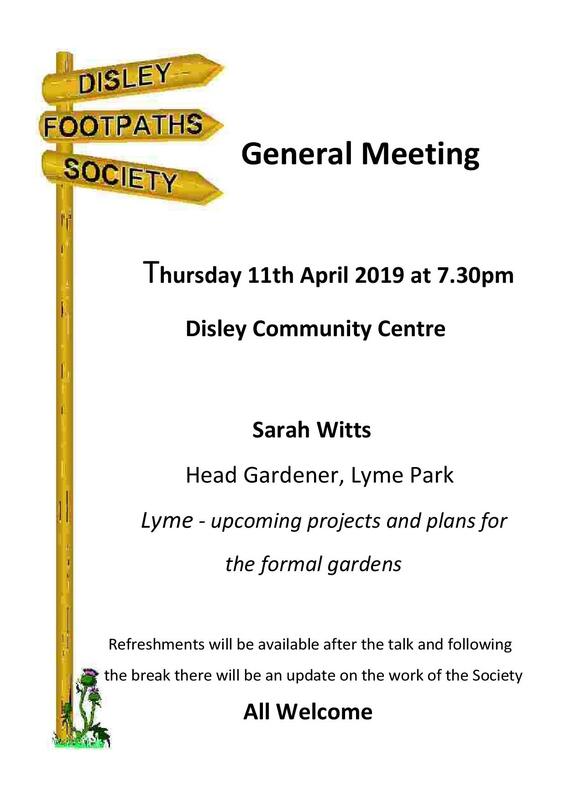 The overall result is that Disley has some of the best signposted and maintained footpaths in Cheshire. Additionally, we offer an organised walks programme each year and arrange general meetings twice a year with guest speakers. 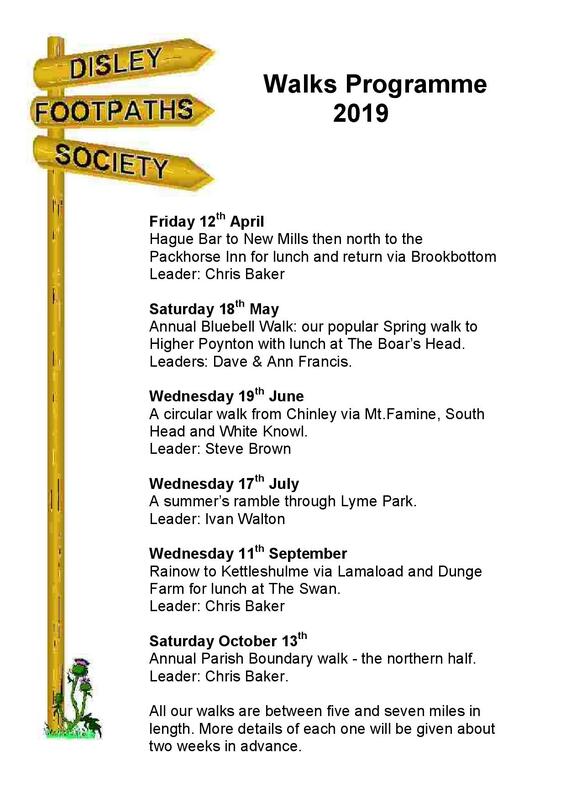 The Disley Footpaths Society Walks Programme for 2019 is shown below. Everyone is welcome but please email Tony Jackson at least two days in advance if you plan to come at tony@arjackson.plus.com. The Programme is available to download HERE. The report is produced annually by volunteer Footpath Inspectors from East Cheshire Ramblers. It is shared with Disley Footpath Society and also passed to Cheshire East Rights Of Way Dept. to assist with remedial and maintenance work. 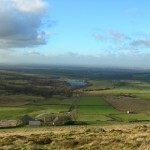 This and other activities of East Cheshire Ramblers can be found on http://ramblerseastcheshire.org.uk. New members are always welcome to join a thriving walking programme.